Do you trust your primary care physician? As a patient, you have probably had the experience of meeting a physician for the first time and very quickly becoming comfortable that he or she has your very best interests utmost in mind. The sense comes quickly; you become comfortable, less anxious. Unfortunately you may have had the opposite experience of encountering a well-educated, well-trained physician who, although technically an expert, left you cold. As a patient, have you ever thought that the doctor wasn’t listening to you? Didn’t seem to understand what was important to you? Was talking in medical speak but not in a language you could understand? That he or she gave bad news to you and left you hanging as to what to do next? Unfortunately, these are the characteristics of the doctor who may be technically expert but not engaged in true healing. The determination, that a doctor is “good” as a clinician comes quickly because the he or she creates a personal connection. Yes, he or she must be knowledgeable. That’s exemplified by the diplomas and certificates proudly framed on the office wall — but it is that ability to “connect” that is part and parcel of the art of medicine. That is the added ingredient that makes the well-trained care giver into a true physician (or nurse or other provider). And of course it is also true that a physician with the “art” but devoid of “science” is just a pleasant quack. What is it that gives you the sense of trust? More than anything it is a physician who actually listens to you. He or she does not interrupt your story other than to question for more details of a point. He or she makes eye contact, maintains it and does not turn around to use the computer to enter your history. You get their full attention and the doctor is non-judgmental while validating your feelings and concerns. You get the sense that the doctor is telling you the truth even when it is a message that you really would prefer not to have to hear. And you get your questions answered in a form that you can understand, not in “medical speak.” Over time, they educate you, lowering the huge information gradient between the two of you. These are all attributes you pick up in the first minutes. It is then that trust develops. Doctors also need to listen and probe if necessary to understand what underlying issues may have precipitated today’s visit. Consider this analogy to the doctor visit. If you were driving your car and the “check engine” light came on you would probably take the car to the garage for a checkup. What would you think if the mechanic just took out the little red light but did nothing else? In medicine that is equivalent to learning of a patient’s symptom, say acid reflux, and just treating it with an acid blocker like Nexium. The drug is very good and may well resolve the discomfort. But it ignores the underlying reason for the discomfort. Was it related to a now chronic stressful situation at work or home? A response to gluten sensitivity? Caused by an anatomic problem with the junction between the stomach and esophagus? An ulcer? Something else? Just treating the symptom is not enough; it is important to get to the root cause. But today with short visits there is precious little time for listening in depth. A 1984 article in the Annals of Internal Medicine indicated that the PCP interrupts the patient within 18 seconds and rarely (23%) lets the patient tell their story, even though when they do it only takes less than two minutes. In a follow-up study in 1999 published in JAMA, they found that it then took 23 seconds before the patient was interrupted — not much improvement — and found that when the patient was allowed to finish their opening statement it took about 30 seconds total, only a few seconds longer than those who were interrupted. Interesting because other research shows that allowing the patient to talk without interruption actually leads to shorter patient visits and a patient who feel more satisfied with the outcome. And further research suggests that health is more likely to improve when the patient perceives a good relationship with the doctor. Medical advances such as new drugs, imaging devices, operating room technology and others are coming rapidly and greatly expanding what can be done for patients. But concurrently it also seems that medicine is so technologically focused that the age old art of listening has become a legend. You are a human with the needs of a human; you need to trust if there is to be a therapeutic interaction. Trust requires listening. It need not be for a prolonged period: It just needs to be real, nonjudgemental listening. Listening in a way that you feel you were heard. Unfortunately, in today’s world of 15-minute visits, dictated by the reimbursement system, that type of listening is often missing. Fortunately more and more PCPs are switching to a new model of care and payment such as direct primary care that allows for the type of interaction that engenders trust — and better health. 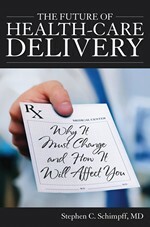 Stephen C. Schimpff is a quasi-retired internist, professor of medicine and public policy, former CEO of the University of Maryland Medical Center, senior advisor to Sage Growth Partners and is the author of The Future of Health-Care Delivery: Why It Must Change and How It Will Affect You.